Whether between parent and child, husband and wife, friends, siblings, or paramours, love is by far the most compelling and fulfilling, but also the most complex and challenging of the roads we negotiate in the long journey through life. The novellas and stories contained within Love on a Small Island are all built upon and revolve around these relationships. In them, Judy Pomeranz presents us with all manner of individuals involved in all manner of relationships doing the best they can to get through the day, and with luck perhaps even figure out how to find happiness and thrive. Tied together only by the common setting of Manhattan and the urban experience that implies, her disparate characters are variously confident, insecure, tough, fragile, bold, timid, tormented, serene, guarded, or open, and occasionally all the above. Like the rest of us, they put one foot in front of the other and hope to reach a place that feels good and right. Also like the rest of us, they rarely quite get there, and when they do it rarely lasts. And yet they persist. Because that’s what people do, and that’s what life is about. These are people we may or may not admire, and may or may not even like, but they are all people whom we relate to and ultimately find ourselves caring for and about. 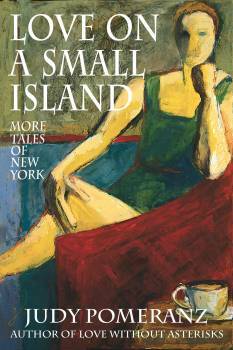 Judy Pomeranz’s sublime New York stories rappel down the shiny pages of previous riffs on the art world, the Hamptons, and so much more. Part Amor Towles, part Hortense Calisher, these are sleekly crafted fictions possessing a droll eye, cheeky dialogue, and a whole lotta heart. The two retro novellas alone will make you a Pomeranz fan. Judy has written reviews of museums and galleries for èlan Magazine for nearly twenty years. She also allowed the magazine to publish her two novellas, Lies Beneath the Surface and Elegy, in serial format. The consummate writer, her expertise, engaging style, and unique point of view shine through in these stories, as in everything she writes. The seven stories in this collection are tied together by a common setting—New York City and its suburbs—and by a common theme: the power of love and its impact on the human condition. This Metropolitan area is a region blessed or cursed by vast socio-economic and cultural disparities, which greatly influence the way people live, think, feel, and react. Love runs through the stories as the single and most important motivating force, but that love takes a multitude of forms, and manifests in hugely different ways from story to story and character to character. We see love and its loss as a powerful force for good in the world, for redemption, and for heightened awareness in the individual. But we also see it as a destructive, dislocating, dystonic, or frightening force. In each story, we see the flip side of love: the impact of its loss, which is either ultimately positive or devastatingly negative. We see love lifting characters to great heights of joy and plunging others into depths of sorrow, despair, and self-destruction. We see how love can expand one character’s worldview while causing other characters to collapse into themselves or run for cover into tiny emotional corners. Love can be dramatic or subtle, intense or gentle, true or false, and in these stories, it manifests in all these ways. Regardless of the manifestation, in the end love is always the most important driver of humanity that exists in fiction, and in the real world.